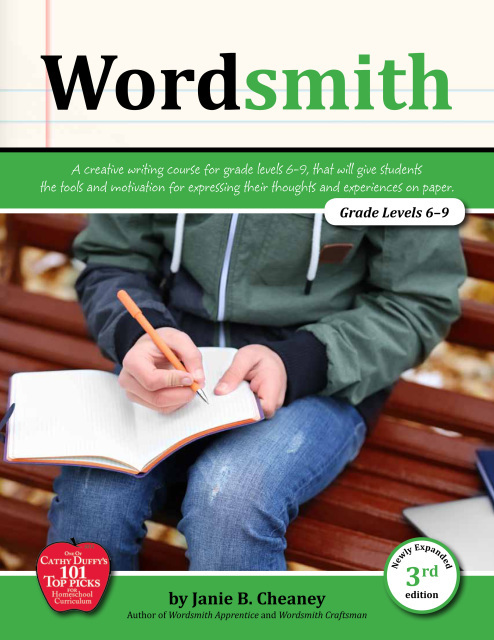 Wordsmith curriculum review (the series by Janie Cheaney): In which Betsy gushes over Wordsmith Apprentice, Wordsmith, and Wordsmith Craftsman. We don’t usually review curriculum resources here at Redeemed Reader. When your colleague writes a terrific writing curriculum and it comes back into print, well, exceptions can be made! 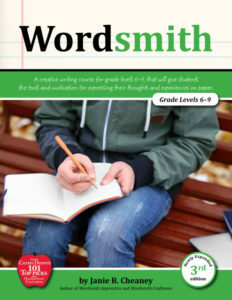 It’s time for a Wordsmith curriculum review! Back in the day, Janie homeschooled her own two children. 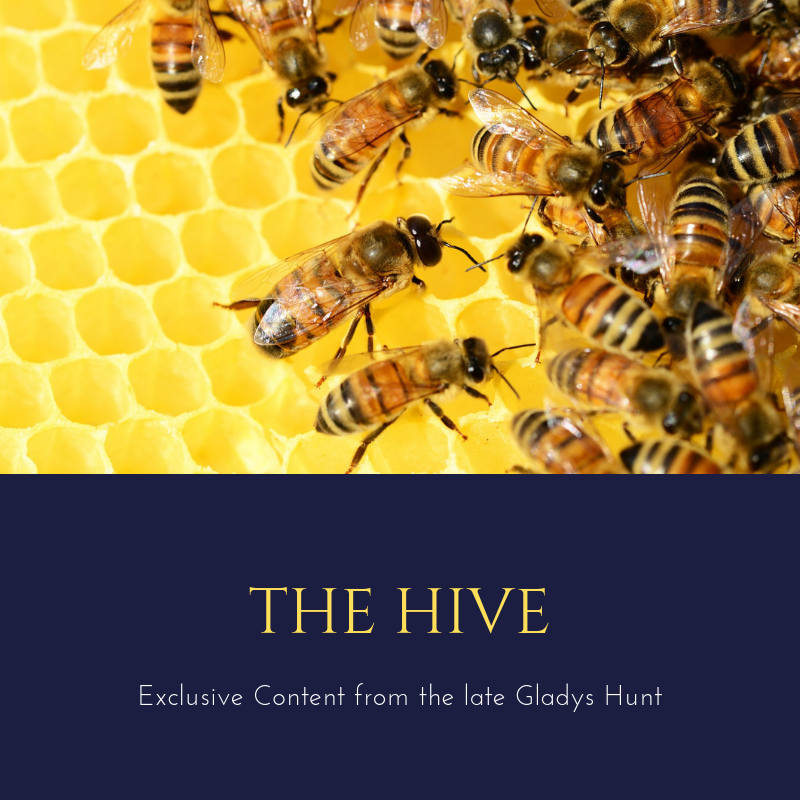 She’s also a published author, has taught creative writing classes, and contributes regularly to World, this website, and her own blog. I’ve been reading–and enjoying and admiring–her writing for years, even before I knew her personally. Along came the day when I started homeschooling my own children, about halfway through their elementary careers. I tried a few highly praised writing curricula only to end up with children who were apathetic about writing, or, worse, actively against writing. As a former middle and high school English teacher, I had definite opinions on the teaching of writing. I also had strong opinions on what those middle and high school students of mine had lacked in their earlier writing education. One enormous lack: students who showed up in high school who hated all writing experiences. Why did so many of my high school students arrive in my classroom absolutely dreading to write when elementary students were bursting with stories? Wordsmith Apprentice to the Rescue! light-hearted: WA doesn’t take itself–or my students–too seriously. The pressure to perform is off. simple and straightforward: It is straightforward to follow, and the directions are simple and clear. There is no magic system to master first. Additionally, most of the work is done in the workbook or a simple composition book (no random pieces of paper cluttering up my house!). thought-provoking: My kids might be writing ads to sell their siblings or newspaper articles about sports teams, but they are having to think about it instead of mindlessly following a prescribed format. Bonus: they’re having fun! grammar review: It’s provided a solid, consistent review of the parts of speech and other fundamentals of the written word. creative: Cartoon illustrations sprinkle the text, and the directions call for creativity on the part of the students with “Imagination Stretchers” and similar exercises. We have shared many laughs as my students share their writing–and they want to share their writing because they’ve put some real thought and creativity into it! self-paced: This is a biggie: upper elementary students are all over the map in their writing abilities. A self-paced curriculum gives students the time they need to think through what they want to write about and to craft their product. All three of my kids are at different points in the book, but they’re right where they need to be. The need for teacher input is minimal (a plus for this busy mom!). Not “Academic”: Upper elementary students are still gaining facility with the written word (some are still learning to read!) and figuring out how to think and what to think. Wordsmith is not asking for outlines, multi-paragraph essays on random research topics, or other academic writing. It’s tackling the “how to write” part of the equation and encouraging young students to think about something before writing about it. There is plenty of time later to put academic polish on writing skills; after all, writing is writing, and the same skills used in newspaper writing or creative storytelling will be helpful when academic essay time comes. 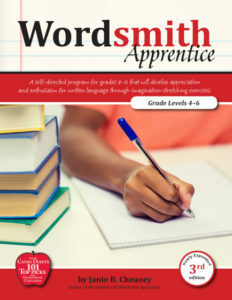 The new-and-improved copy of Wordsmith Apprentice arrived in my mailbox this week (pictured above), and it’s fantastic! Much needed improvements have been made compared with my older versions (I have two different older versions). The content is relatively unchanged (a plus), but the fonts are vastly improved. Janie’s son illustrated the first editions, and his updated illustrations are terrific. He’s matured as an artist. The newer books are even easier to read and navigate, but the essence of the curriculum is unchanged. structured: Weekly plans help foster more structure and more time management skills (perfect for middle school kids!). creative: The focus is on creative storytelling rather than newspaper reporting. Middle school kids are wildly creative–when we let them. By this point, they (should) have read widely, and we should see some of that reflected in their creative writing as they imitate authors they enjoy. editing and crafting: More emphasis on editing in this volume as well as honing word choice and sentence construction force students to examine their writing for strengths and weaknesses. This is good preparation for more academic writing in high school. simple and straightforward: Again, the book is very straightforward and easy to follow. thought-provoking: Again, the book requires a lot of thinking! Turning an adverb and verb into one, more vivid verb requires a lot more thought than simply underlining the vivid verbs in someone else’s writing. teacher’s guide: Diagramming is introduced–appropriately as a servant to better mastery of grammar and NOT as an end in itself–as well as such concepts as active and passive voice. A teacher’s guide is very helpful if these concepts are rusty for the teacher, too! Additionally, possible schedules are laid out. Wordsmith Craftsman: To Infinity and Beyond! Student-Directed: Students are required to use a planner and to make their own deadlines. This is such fantastic time management training, it makes the book worth it just for that. Of course, depending on the student, educators will want to check up on the deadlines until responsibility can be demonstrated. Real Life Application: The first section of the book covers real life writing: letters, outlining, business reports, and more. Good communication skills are needed for far more in life than a 5-paragraph essay or teacher-assigned research paper. I used to teach my high school seniors how to write cover letters and resumés! Grammar Review: There isn’t much grammar review (also appropriate for high school), and the focus is on the writer’s voice. Using strong verbs, maintaining good paragraph unity, and developing a personal style are important for any form of communication. Academic Essays: Various styles of academic writing are covered: narrative essays, persuasive essays, research papers, and more. Janie gives great suggestions for how to structure the essays, how to do preliminary research and content formation, and how to edit as well as providing direction for the basic structure. This section naturally lends itself to more writing projects should the student need them. Wordsmith won’t be the perfect fit for everyone because no single curriculum is a perfect fit for everyone. It’s an outstanding choice for most kids, though, especially if the educators (parents or school teachers) are more interested in their students developing a strong writing voice and more enjoyment in their writing life instead of jumping through academic writing hoops. Those wanting a curriculum with strong emphasis from the beginning on the traditional essay format won’t find their needs met in Wordsmith. Additionally, educators who require more daily structure or a “plan” might find Wordsmith too student-paced. I’d argue that learning to write is a lot like learning math: students will do better at the higher levels of both if they’ve had teachers from the beginning that made sure they were comfortable with the “language” of the subject and had truly mastered the basics. In writing, the basics are NOT five-paragraph essays–or even a whole paragraph. The basics are good word choice and strong sentence structure. Writers also must have something to say. Wordsmith delivers that in spades. Who knows… our young students might grow up like Janie and publish their own novels or earn their living through their writing! My three children have big plans along these lines. That’s a far more interesting prospect than simply earning an “A” in English 101. Interested in reading some of Janie’s thoughts on writing? I interviewed her on this very subject. Interested in checking out the Wordsmith books for yourself? Find them at Common Sense Press. 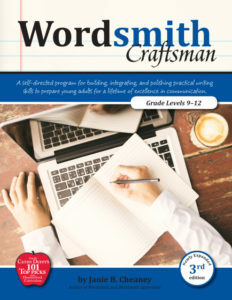 I received free copies of the updated Wordsmith Apprentice and Wordsmith Craftsman in return for my fair review. Of note: I requested the Craftsman title because I already owned older editions of Wordsmith Apprentice and the updated edition of Wordsmith and liked them so much!